The Pulsar 7 Pocket vaporizer is a slim, compact pen-style herbal vaporizer with “one button” activation – offering you complete portability and discreet operation. The Pulsar 7 Pocket herbal vaporizer features a ceramic heating element with an auto-shutoff timer that prevents overheating and extends the overall life of unit. Only 5 inches tall, this unit is small enough to fit inside your pocket or purse and can be used almost anywhere. With an unbelievable heat-up time, the Pulsar 7 vape is capable of reaching vaporizing temperatures within a matter of seconds. The Pulsar 7 Pocket vaporizer utilizes an internal rechargeable battery which provides a long battery life and convenient charging options (USB Charger and AC Adapter). This unit incorporates a “one button” activation system, which makes the vaporizer very easy to operate. Simply hold the button down for about 10-15 seconds and you’re ready to start vaporizing. It’s that simple. 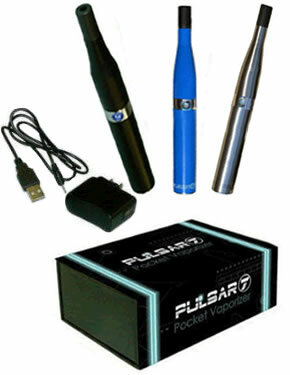 The Pulsar 7 herbal vaporizer also features an LED light display for both the heating element and the battery charger. The high-quality ceramic heating element ensures that your herbs are being vaporized safely and efficiently. Each unit also includes includes a 6 month warranty.